Using ESA's infrared Herschel space observatory and spectrometers on the twin 10-metre W.M. Keck telescopes on Mauna Kea, Hawaii, astronomers characterized 767 previously unseen starburst galaxies, revealing extraordinary high star-formation rates across the history of the Universe. Using ESA's infrared Herschel space observatory and spectrometers on the twin 10-metre W.M. Keck telescopes on Mauna Kea, Hawaii, astronomers characterized 767 previously unseen starburst galaxies, revealing extraordinary high star-formation rates across the history of the Universe. Starburst galaxies give birth to hundreds of solar masses' worth of stars each year in short-lived but intense events. By comparison, our own Milky Way Galaxy on average produces the equivalent of only one Sun-like star per year. Starburst galaxies generate so much starlight that they should outshine our Galaxy hundreds to thousands of times over, but the enormous quantities of gas fueling them also contain vast amounts of dust as a result of the frantic star formation. The dust absorbs much of the visible light, meaning that many of them look quite insignificant in that part of the spectrum. However, the dust is warmed by the surrounding hot stars and re-emits the energy at far-infrared wavelengths. Using ESA's infrared Herschel space observatory, astronomers measured the temperature and brightness of thousands of dusty galaxies. From these, their star-formation rate could be then calculated. "Starburst galaxies are the brightest galaxies in the Universe and contribute significantly to cosmic star formation, so it's important to study them in detail and understand their properties,"" says Dr Caitlin Casey of the University of Hawaii, lead author of the papers, "A redshift survey of Herschel far-infrared selected starbursts and implications for obscured star formation" and "A population of z > 2 far-infrared Herschel-SPIRE selected starbursts," discussing the results in the Astrophysical Journal. "Some of the galaxies found in this new survey have star-formation rates equivalent to the birth of several thousand solar-mass stars per year, constituting some of the brightest infrared galaxies yet discovered." 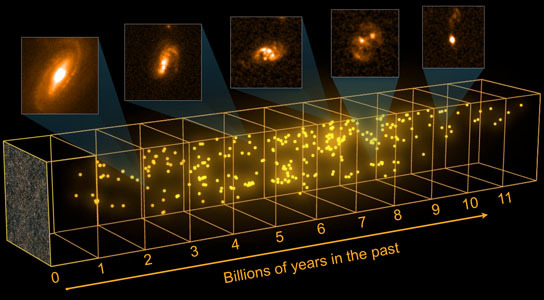 To provide context to the observations and understand how star formation has changed over the Universe's 13.7 billion year history, the distances to the galaxies were also needed. With Herschel signposting the way, Dr Casey's team used spectrometers on the twin 10-metre W.M. Keck telescopes on Mauna Kea, Hawaii, and obtained the redshifts of 767 of the starburst galaxies. Redshifts provide astronomers with a measure of how long the light from each galaxy has traveled across the Universe, which, in turn, indicates when in cosmic history the light from each galaxy was emitted. For most of the galaxies it was found that the light has been traveling towards us for 10 billion years or less. About 5% of the galaxies are at even greater redshifts: their light was emitted when the Universe was only 1-3 billion years old. "The Herschel data tell us how fiercely and prolifically these galaxies are producing stars," says Seb Oliver from University of Sussex, UK, and Principal Investigator for the HerMES Key Programme, within which the data have been collected. "Combining this information with the distances provided by the Keck data, we can uncover the contribution of the starburst galaxies to the total amount of stars produced across the history of the Universe." How such large numbers of starburst galaxies formed during the first few billions of years of the Universe's existence poses a vital problem for galaxy formation and evolution studies. One leading theory proposes that a collision between two young galaxies could have sparked an intense short-lived phase of star formation.